Rockstar Energy Husqvarna Factory Racing’s Jason Anderson earned his first 450 Main Event podium of the season on Saturday at the Glendale Supercross, the second round of the 2019 AMA Supercross series, held at the State Farm Stadium in Glendale, Ariz. To add to the team’s success was teammate Michael Mosiman who improved on his results from last week’s opener by grabbing his first top-10 finish of the season in the 250SX West class. Jason Anderson was looking to redeem himself after finishing outside the top-10 at last week’s Anaheim season opener. He was mid-pack at the start of his 450 heat race and came out of the first lap in eighth. 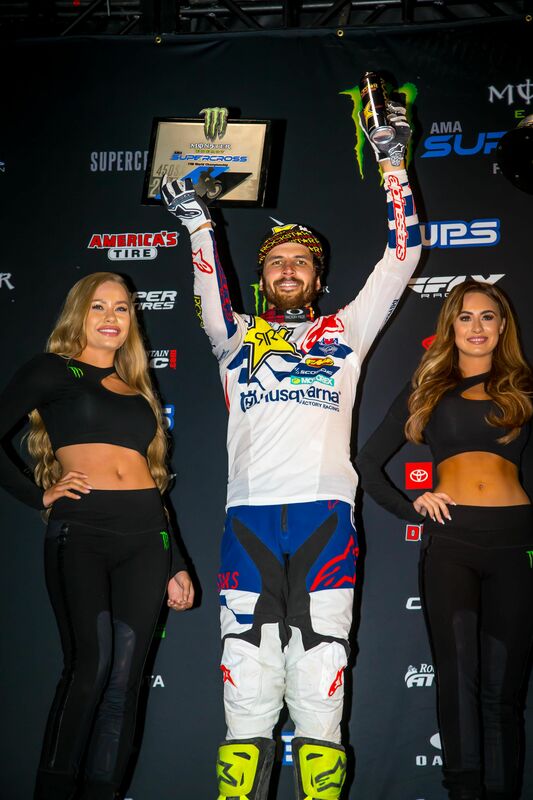 He gained two spots and finished sixth to transfer to the 450 Main Event. He was top-five at the start of the Main and quickly navigated into the top-three before charging into the second-place spot. He was riding strong but was forced to restart the race in a staggered start after the red flag came out due to an injured rider on the track. He came back with a vengeance after the restart and made an impressive charge for the lead. He was patient and observed the leader for a few laps before making a quick inside corner pass to take over the lead. He maintained control but went back to second after getting passed with one minute remaining in the race. He held strong to finish second. He is currently seventh in 450 rider point standings. Michael Mosiman was also looking to improve on his results from the season opener. He was second at the start of his 250SX West heat and went to battle in the top-three. He held his position for the majority of the race until the last lap then crossed the finish line in fourth to earn a direct transfer to the 250 Main Event. He was mid-pack at the start of the Main and stayed consistent, then put in work to charge to a 10th place finish. He is currently ninth in 250SX West rider point standings.